On the idyllic island of Maui, the main attractions are the beautiful surroundings. Majestic Haleakala and the west Maui mountains reaching for the sky, the incredible white and sunny beaches of the south side, the dramatic wind and waves of the north shore, and the distant, mysterious beauty of Hana. People come from all over the world to sight see, dive, windsurf, fish, whale watch, and recreate in an exotic, tropical paradise. So for those interested in learning Prolotherapy and the newest uses of platelet-rich plasma injection, doing so on Maui proved to be irresistible. The course was located on the north shore of Maui in a beautiful waterfront location where turtles could be seen from the expansive lawn while integrative, regenerative Qigong was practiced as part of the course. Participants from as far as Saipan and Vancouver, BC came together for the five-day training course in April 2010, sponsored by the Natural Medicine Clinic. The course format was lecture for a few hours followed by hands on practicum doing Prolotherapy. A host of conditions were treated including chronic low back pain, tendinosis of the shoulder, elbow, knee, ankle, and spine, instability of all the major joints, and advanced degenerative arthrosis of hips, knees, shoulders, ankles, wrists, and spine. The course participants, who ranged from medical students to senior doctors, treated many chronic musculoskeletal conditions under supervision with classic Hackett-Hemwall dextrose Prolotherapy and platelet-rich plasma (PRP) injection. Instruction and demonstration of diagnostic ultrasound, ultrasound guided injection, and an introduction to venous sclerotherapy was also part of the training. The inclusion of sclerotherapy for varicose veins in the training was especially gratifying for this author as many of the traditional practitioners of Prolotherapy also treated varicose veins with this technique and, like Prolotherapy, there are insufficient numbers of experienced doctors competent in this. A particular challenge of this course was effective instruction to all the participants. With such a wide gap of experience, some doctors in practice for more than thirty years and some not even in practice yet, how could they all be taught at their level of expertise in a group setting? This challenge was greatly aided by the obvious enthusiasm of the group, the pairing with practicum faculty, and the overall group dynamics. One participant, a local Emergency Department physician, promptly returned to his ED and, a bit to his astonishment, had immediate success treating acute back pain with Prolotherapy. Prior to this, he was most likely to follow conventional standard protocol and prescribe pain meds and muscle relaxers with a likely referral for physical therapy or acupuncture. After discussing his new skills with his ED colleagues, he is now empowered to help many more patients with acute and chronic pain and wants to expand his options. The community benefit will be more timely, cost-effective care at the point of entry into the healthcare system. The practicum sessions were the highlight of the course. Participants were in groups of four and either practiced on each other or on the many community volunteers we had from local doctors bringing their patients. 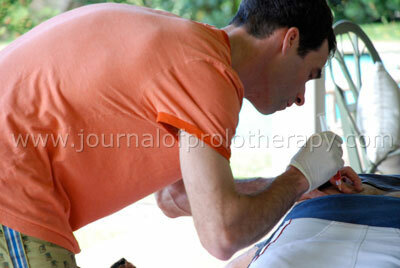 Each day 15-20 people were treated with dextrose Prolotherapy or platelet-rich plasma for many different problems. Chronic spinal pain, shoulder arthrosis and instability, many elbow, knee, and ankle problems, degenerative hip pain, Achilles tendinosis, and even varicose veins were treated. Some patients were evaluated with state of the art musculoskeletal ultrasonography using the Biosound Esaote MyLab 25 Gold, which offers resolution higher than MRI. Ultrasound guided injection was also utilized but the primary reliance was on good old-fashioned palpatory injection technique that is known to yield excellent results. Overall, participants experienced many of the common clinical presentations of those seeking Prolotherapy and learned classic, as well as more modern, injection approaches and techniques. 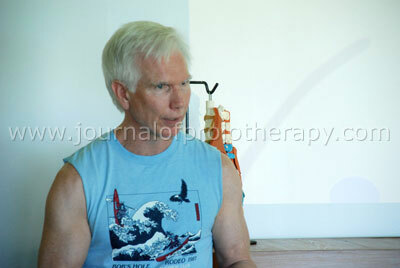 In addition to learning Prolotherapy, there was daily integrative Qigong taught by Kevin Davison, ND. This system utilizes variable passive and active range of motion to enhance and maintain joint, ligament, and tendon function. This portion of the course was a highlight for many. Harry Adelson, ND lectured on some of the newest regenerative techniques utilizing PRP and adipose tissue to enhance tissue scaffolding, provide mesenchymal stem cells, and growth factors in orthopedic and aesthetic techniques. Dhai Barr, ND also demonstrated aesthetic use of PRP in the face and neck regions with Dr. Adelson. There were great clinical discussions around the use of these techniques in regard to sports, orthopedic, and emergency medicine. Careful PRP in the thoracic spine. With the format of the course leaving most of the afternoon available to explore Maui’s diverse offerings, participants and faculty engaged in recreational activities including surfing, kitesurfing, stand up paddling, hiking Haleakala and Hana, mountain biking, playing music, sightseeing, beachcombing, swimming, and canoeing. The addition of the daily recreational time was a wonderful aspect of the training as participants and faculty returned early the next day rested and truly enthusiastic to learn as much as possible during the course. As one who has instructed many in learning the art and science of Prolotherapy, I would have to say that this group was one of the most adept, and the venue was the most pleasant I have had the privilege of teaching. There was discussion of making this an annual training in a collegial, fun, and informal setting. If you are interested please contact the author to be placed on the mailing list for future courses.